Temptu has quietly introduced another potential game changer with the release of the first eyeshadow colors in the new Perfect Canvas / Hydralock formula. 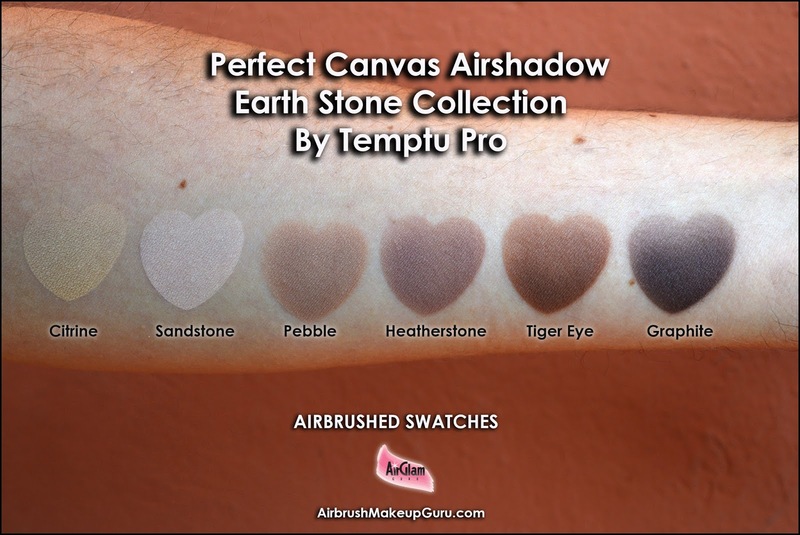 The Earth Stone Collection includes six earthy, neutral shades that constitute the ideal palette for any natural tone or smokey look. My guess is that the brand wanted to test the waters for an eyeshadow line by starting with the basic go-to colors that any makeup artist cannot do without, encouraging the public to experiment more with their Temptu Air system and with their Airpod Pro. Once again I find that congratulations are in order, because Temptu absolutely aced this product. Unfortunately there is a lot of prejudice among makeup artists on the idea of airbrushing eye shadow. Many imagine that the level of skill required to work on such a tiny space as the eyelid surpasses their own, while others have had less than satisfactory experiences with the way the colors behave on the mobile lid, especially when using silicone based formulae. The classic Temptu S/B line, which I absolutely love, does imply a little learning curve when it comes to using the many beautiful shades available for eyeshadow. In order to avoid creasing, the S/B colors require lid preparation, a thin, layered application, very thorough drying of each layer and possibly setting spray before eyes can be opened in order to avoid creasing. That said, once these precautions have been taken, the color payoff is amazing and the product will stay perfect for hours and will be completely waterproof. These Perfect Canvas Airshadows simply retain all the good qualities of the S/B line, at the same time doing away with the drawbacks. They dry quickly and do not require extra prep or setting. They do not crease or move, and are also totally waterproof, with a perfect wear for hours and hours. Because of the tonality they are also super easy to blend. In short creating a beautiful eye makeup is literally a breeze even for less experienced airbrushers, who will become proficient at using them after a simple try or two. Moreover, the colors are very comfortable to wear and feel soft on the skin, and do not feel or look in any way heavy, in fact quite the opposite. The Earth Stone Collection comes as a starter set of 7.5 ml bottles for use with your traditional airbrush or with the Airpod Pro. Each color also comes in Airpod form for use with the Temtpu Air System or with the Airpod airbrush. As far as the application goes, I have shot the enclosed video tutorial to show how the colors can be easily used with the portable system and the Airpod Pro. Personally, I still prefer my traditional airbrush as I feel that I can achieve a more precise, easier to control application. Having said that I do believe it is just a matter of habit, and if you use your pods often enough you should have no particular problem in getting good results with that option. An important complement in achieving the look of the video was also Temptu's new Perfect Canvas Color Corrector set. This bundle contains seven popular complementary colors that can correct any type of skin irregularity. Once again this is a fantastic product with an amazing correcting power, that works perfectly for the Hydralock/Perfect Canvas Foundation line, which is by nature sheerer in order to allow for a natural finish. The correctors work so fast and so undetectably that it was hard to render in the video we shot. It took only a couple of second to neutralize our model's under eye area perfectly. Once again this product represents a fly in the face of the false myth that you "cannot airbrush around the eyes". You can indeed, and indeed you should, with the right amount of pressure and after a little practice to make sure you are using your tools correctly around the delicate eye area. 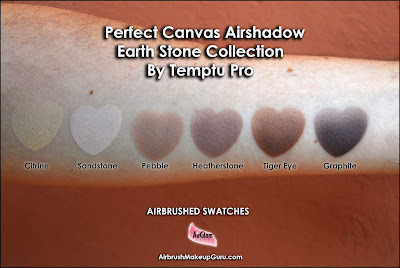 Temptu has already switched their highlighters and blush airpod lines to the new Hydralock formula, which makes them completely compatible with the Airshadow range and opens up a whole lot of possibilities for eyeshadow designs. I really hope that they will soon offer more Airshadow colors, perhaps reissue the former S/B Hi Def and Multicolors selections with the new Hydralock formulation as well, so that we can continue using bold and beautiful colors. I hope this video and review will inspire more people to try airbrushing eyeshadow. Aside form the advantages of speed, durability, hygiene, no transfer and waterproof finish, airbrushing eye looks is jut plain fun!.